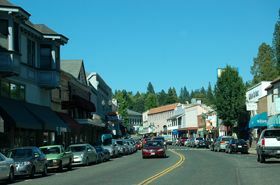 Placerville, California is but one more of the many settlements that got its start when James Marshall discovered gold in nearby Coloma, California in January, 1848. Marshall, who was working for John Sutter, building a sawmill, made the discovery in the tail race of the mill and soon reported his find to his employer, who swore Marshall, as well as all of his employees to secrecy. But, such “news” was just too big to be kept quiet, and in no time, word of the find leaked and thousands of men were crawling the ravines and hills in search of their fortunes. Some ten miles from Coloma, a new “camp” sprang up on the banks of what is today called Hangtown Creek in the summer of 1848. The camp was initially referred to as “Dry Diggins” because of the way miners moved cartloads of dry soil to running water to separate the gold from the dirt. The camp, the first of some 30 small settlements to spring up in the Coloma area, was at first little more than a tent city. However, when California’s Military Governor, Colonel Richard B. Mason reported to President Polk, that the camp was hauling out thousands of dollars worth of gold, the settlement boomed and soon became a central supply and transportation center for the area. Like other mining camps and Old West towns filled with men, it soon took on a hell-raising reputation. Seeing opportunity, the camp not only filled with miners, but also with murderers, road-agents, fugitives, deserters and thieves, intent on making their wealth not in back-breaking labor, but by taking the gold at knife or gunpoint. By the end of 1848 crime had become a serious issue in the mines. California was then a province of Mexico occupied by American forces and under martial law declared by California’s military governor. There were no laws, police, jails, courts, or a prison. American miners played a major role in establishing American frontier government based in democracy and American jurisprudence in the mining regions. On January 22, 1849 the first miner’s court was convened in California at Old Dry Diggings after five men were arrested in the act of armed robbery. Three of the men arrested were identified as having committed a previous robbery and attempted murder. Though miner’s courts were established to settle claim disputes among the miners they also heard criminal cases usually after some outrage had occurred. The Old Dry Diggings case resulted in swift punishment for the outlaws. The two charged with armed robbery received a sentence of 39 lashes each and banishment from the mines. The three convicted for the prior robbery and attempted murder were hung. Often hanged at a giant oak tree on the town’s main street, the camp was renamed “Hangtown” in 1849. Though the camp was primarily populated by men, many brought along their families and by the next year the temperance league and a few local churches began to request that a friendlier name be bestowed upon the town. However, it would be several years later before an official name change would take place. By 1854, Hangtown had become the third largest city in California, which by this time had become a state, surpassed only by San Francisco and Sacramento. When it was incorporated that year, the name was changed to Placerville. The same year, an election was held to try to wrestle the county seat away from Coloma, but Placerville was not the only competitor. Three other communities joined in the running and none could muster enough votes to upset Coloma. 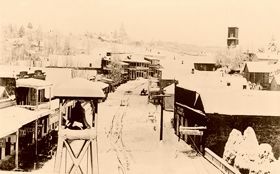 As millions of dollars in gold were taken from the many mines of the area, Placerville received its first railroad in 1856, providing a welcome relief to the miners who formerly were forced to haul the ore in wagons over muddy and dusty trails. However, that very same year, the burgeoning city suffered its first major loss when it was nearly destroyed by fire on July 6th. But, the city was determined to recover and later that year, took on Coloma again to try to move the county seat. This time, the election was limited to just the two towns. Again, the official vote showed Coloma the victor, but a group of indignant Placerville citizens called a meeting to air their suspicions of ballot box stuffing and election fraud. Apparently, the evidence supporting the charges was sufficient to convince the State Legislature to settle the matter once and for all. In the end, by an act of the California Legislature, the county seat was moved to Placerville in 1857, where it remains today. Like other mining communities, the gold soon began to play out and many miners moved on to richer finds. However, the city regained new life as a transportation center when the silver was discovered at the Comstock Lode in Nevada in 1859. In fact, from 1859 to 1866, the Placerville-Carson Road witnessed the greatest era of freighting and staging by horse-drawn vehicles ever known. But, that too, would not last. 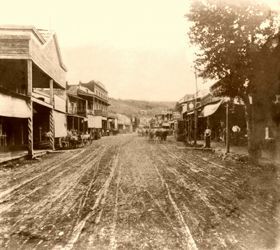 Once again, the population began to move on and in 1873, due to a dispute with the railroad; the City of Placerville was disbanded. Dozens of other mining camps suffered the same fate, leaving nothing of places such as Bottle Hill, Georgia Slide, and Murderer’s Bar. However, Placerville was destined to survive, turning to lumber, agriculture and light manufacturing. The town was re-incorporated in 1900. Today, this historic gold rush community, of some 10,000 people provides a wealth of history in its many old buildings and historical markers. Interesting places to visit include the Cary House Hotel, built in 1857, which continues to cater to travelers today. The Placerville Hardware Store on downtown Main Street is the oldest hardware store west of the Mississippi, having continuously operated since 1852. Today’s buyer can still purchase gold panning equipment, knives, cast iron and more at this historic establishment, much like those miners did a more than a century and a half ago. The Combellack-Blair House, an 1895 Queen Anne Mansion, now serves as a bed and breakfast inn and is on the National Register of Historic Places. The Fountain-Tallman Museum at 524 Main Street is located in the original soda works building dating back to 1852. The museum displays artifacts and exhibits about Placerville’s history. The Placerville News Building, built in 1856, is still home to the Placerville News Company. The 1857 City Hall, as well as the 1863 Courthouse continue to stand, serving their original purpose. Another important historic landmark that still remains on Main Street is the Bell Tower, standing as a monument to the city’s volunteer firemen. The Bell, placed in the tower in the plaza in 1865, was used as an alarm system to call out the firefighters. This tower has watched most of Placerville’s history pass beneath it for well over 100 years. It has been remodeled, relocated, and most recently, renovated. The history of the Bell Tower began back in 1856 when three fires that year in April, July and August, claimed most of Placerville’s business section. The need for an alarm system to call the volunteer fire department was obvious, and a bell was ordered from England. Cast in 1860, the bell arrived in Placerville in 1865. The city gave it’s approval to place the bell in a tower in the plaza. All this was done at a cost of $380.00. Today, the Bell Tower serves as a gathering place for parades, celebrations, and other Historic Main Street events. 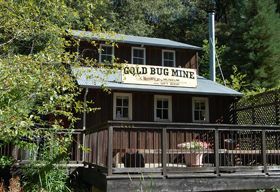 A “must see” while visiting Placerville is Hangtown’s Gold Bug Park & Mine, a 62 acre park that was once dotted with over 250 mines. Today, the park has been developed as an historical site, as well as a picnic and hiking area. The Gold Bug Mine still stands, including it stamp mill and can be toured. These are but a few sites to see in this historic charming city, which provides a Historic Walking Tour with many of these sites as well as several others.